Upon infection of Escherichia coli, bacteriophage λ may elicit either a lytic or a lysogenic response. In the lytic response the infected cell is killed but produces many copies of the phage. In the lysogenic program the phage’s lytic functions are repressed, and its DNA persists in the surviving cell integrated in the chromosome as a prophage. The prophage may be induced into the lytic cycle by inactivating the repression system. When this occurs, the phage DNA is excised from the host chromosome, replicated, and packaged into viral particles. Many copies of the phage are produced, as in the lytic response to infection. Both integration of phage DNA into, and excision of prophage DNA from the bacterial chromosome require the phage-directed Int protein and the bacterial integration host factor (IHF). 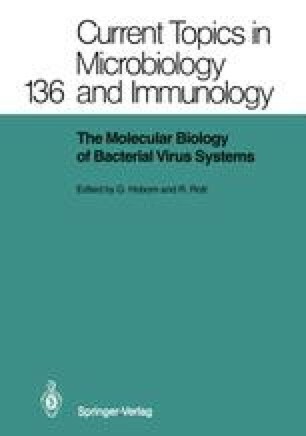 The excision reaction also requires Xis protein encoded by the phage genome (see Weisberg and Landy 1983 for a review).